The StoreEDGE is a shortened, high-speed SD card that allows you to use your MacBook’s SDXC slot to expand your storage and it sits nearly flush to your notebook’s edge, allowing you to stay fully mobile. These would obviously work in iMacs or Mac Minis as well and probably still fit in many cameras and other full sized SD card devices. We’re seeing at MacMall/eCost 64GB for $78, Amazon for $72-$80+shipping. The 128GB can be found at a few retailers for about double. PNY Introduces StorEDGE™ Flash Memory Expansion Module Available in 64GB and 128GB Capacities Parsippany, NJ – August 22, 2013 – PNY Technologies® , Inc. (“PNY”) today announced the introduction of StorEDGE™: a revolutionary new Flash Memory Expansion Module designed exclusively for use in MacBook computers to quickly and easily increase available storage capacity while keeping you mobile. Engineered as a semi-permanent storage solution, StorEdge simply plugs directly into your MacBook to radically upgrade your flash memory without compromising your notebook’s sleek design. StorEdge hosts a small form factor and unobtrusive patent pending design, allowing it to sit nearly flush to your MacBook. Available in 64GB and 128GB capacities, StorEdge allows users to store even more images, videos, music, and files – without compromising system speed or performance. “This convenient new product produces a hassle-free option for consumers to easily upgrade the amount of storage available to their MacBook,” said Myra Hines, senior marketing manager at PNY. “Once plugged in, StorEdge appears as an additional drive on your computer; allowing for easy access, convenient drag and drop, and searchable content through finder. With no installation required, users have the added benefit of not having to worry about unplugging or disconnecting, as they would with other storage devices. StorEdge is ideal for MacBook users seeking more storage while keeping their notebook – and their priceless information – ultraportable.” StorEDGE  64GB MSRP: $99.99  128GB MSRP: $199.99 The PNY StorEdge is compatible with the 13-inch MacBook Air, MacBook Pro, and MacBook Pro with Retina display. 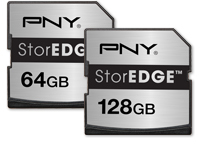 The PNY StorEdge is available now for purchase at select e-tailers and retailers such as Amazon and Best Buy, as well as PNY.com and through authorized PNY distribution partners. For more information on the complete line of products that PNY has to offer, visit www.PNY.com.